Shop online for 137 chooch model trains at discounts up to 24%. Railroad Scenery is the most popular of the 5 chooch model trains categories, then Freight Cars, and Bridge-Trestle-Girder. This is the HO Scale Flexible Cut Stone Wall w/Self-Adhesive Backing - Small Stones (13 x 3-3/8'') by Chooch Enterprises. This is the HO Scale Flexible Cut Stone Wall w/Self-Adhesive Backing - Medium Stones (13-1/4 x 3-3/8'') by Chooch Enterprises. These are Loads of Heavy Shipping Crates by Chooch Enterprises. This is a Load of Coiled Steel by Chooch Enterprises. This is the HO Scale Flexible Random Stone Wall w/Self-Adhesive Backing - Medium Stones (14 x 3-1/4'') by Chooch Enterprises. This is a HO Scale Random Stone Interconnecting Wall by Chooch Enterprises. (7 x 3-3/8''). These are Loads of Open Crated Machinery by Chooch Enterprises. These are Loads of Heavy Cable Spools by Chooch Enterprises. 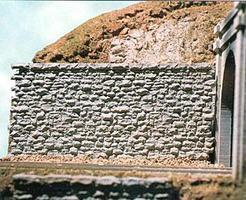 This is a HO Scale Single Cut Stone Bridge Abutment by Chooch Enterprises. (3-1/4 x 3/4 x 3-1/2''). This is a Load of Random Baled Scrap by Chooch Enterprises. 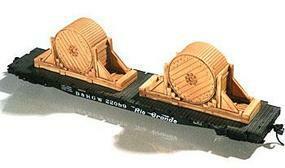 This is the HO Scale Pulpwood Load Fits Atlas Pulpwood Car by Chooch Enterprises. These are Loads of Heavy Steam Equipment by Chooch Enterprises. 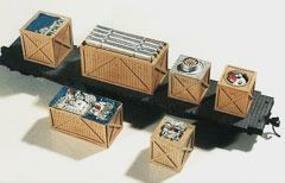 These are N Scale Single Stone Bridge Abutments by Chooch Enterprises. This is a Load of Stamping Scraps by Chooch Enterprises. This is a Load of Heavy Tires by Chooch Enterprises. This is a Tapered Cut Stone Bridge Abutment by Chooch Enterprises. This is a Load of Coiled Wire by Chooch Enterprises. 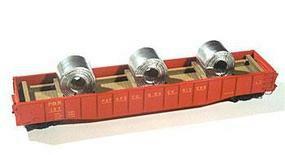 This is the HO Scale Steam Boiler Equipment Load 40-Ton by Chooch Enterprises. 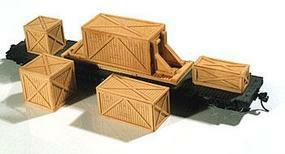 These are N Scale Double Stone Bridge Abutments by Chooch Enterprises.